More of the Nightvault Warbands have been getting rules for Age of Sigmar, which isn’t really surprising, but it is incredibly cool to see how they make the transformation from Underworlds fighters to Age of Sigmar warriors. 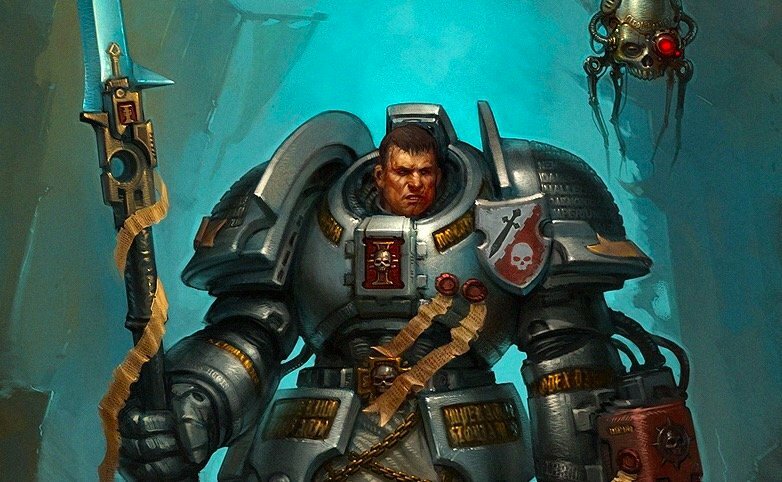 There’s a trick to making sure the flavor of the model still comes through as it makes the transition, but still keeping it balanced (or indeed even viable) in the Age of Sigmar. Mollog’s Mob and the Godsworn Hunt are two very different Warbands but both have made the jump nicely. 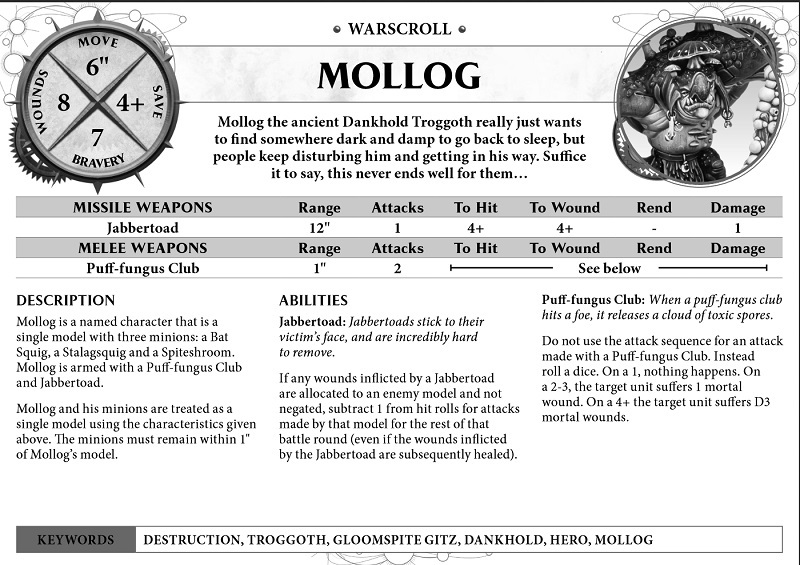 First up, let’s take a look at Mollog, the ancient Dankhold Troggoth. 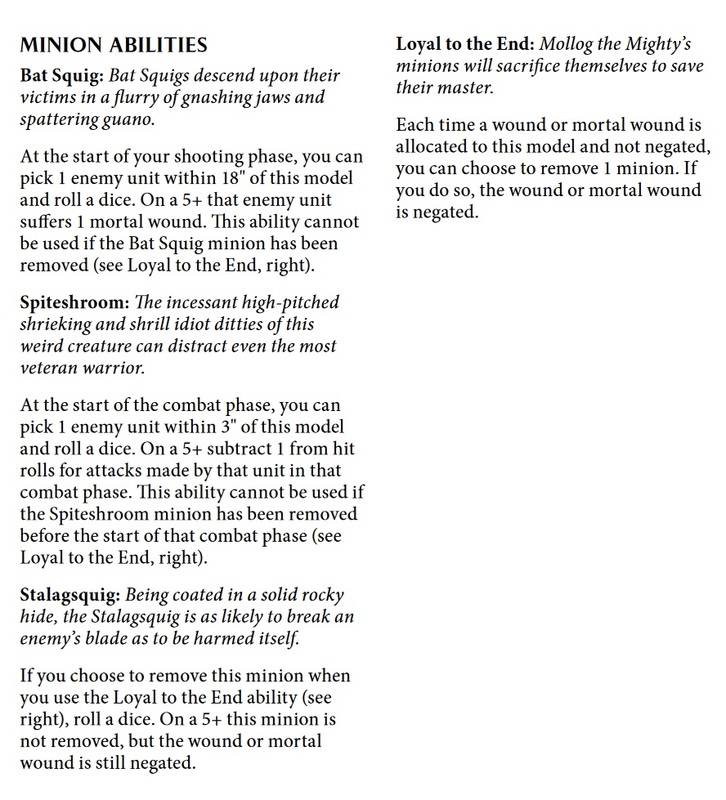 He and his band of specialized squigs are all treated as a single model now, with his minions giving him different abilities, as well as helping him ignore wounds or mortal wounds when they come his way. 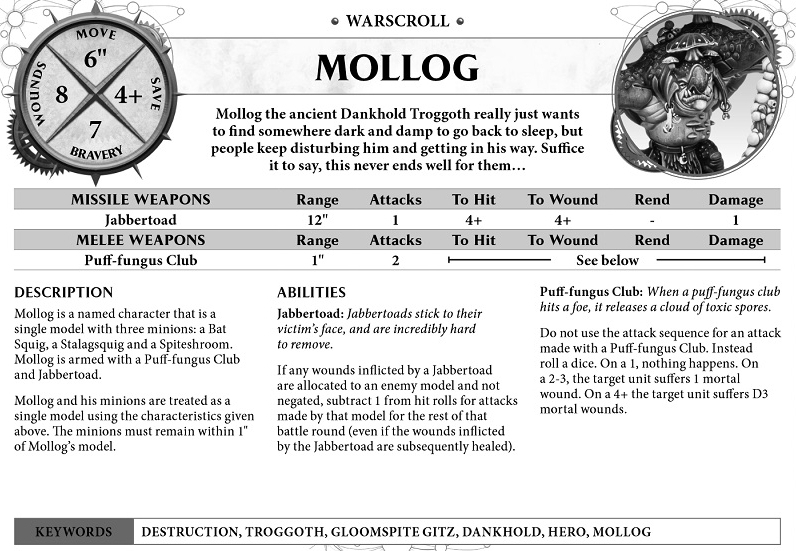 As you can see Mollog is no slouch himself–with 2 attacks that can potentially deal d3 mortal wounds each, and a ranged attack that applies a debuff to units in ranged and melee combat, Mollog can put down even the most troubling opponents. And with Troggoth regeneration and Magic resistance, he’s surprisingly difficult to stop. And all that before we get to his minions. Each of which gives him a minor buff on a 5+, and which can eat wounds or mortal wounds to give Mollog even more staying power. 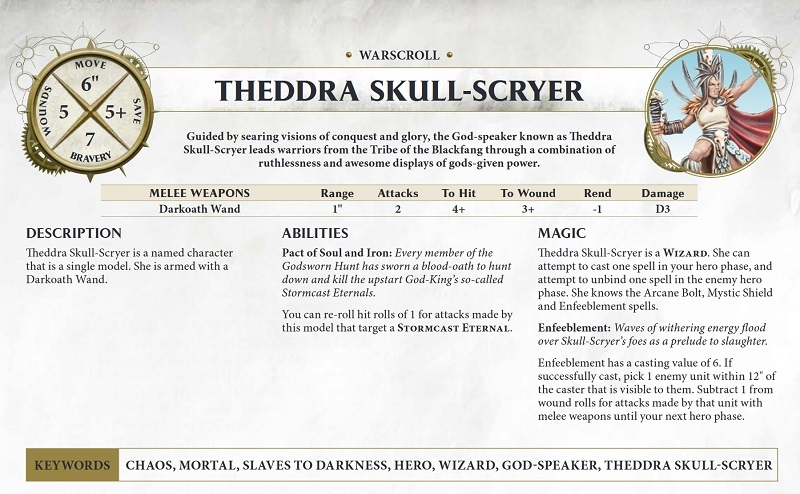 They especially hate the Stormcast Eternals, which is nice, but the real fun is in her Enfeeblement spell. Giving -1 to wound rolls, even just on melee units, might help keep you alive. And her Darkoath Wand means she’s no slouch in combat, but she’s far better when supported by her friends. 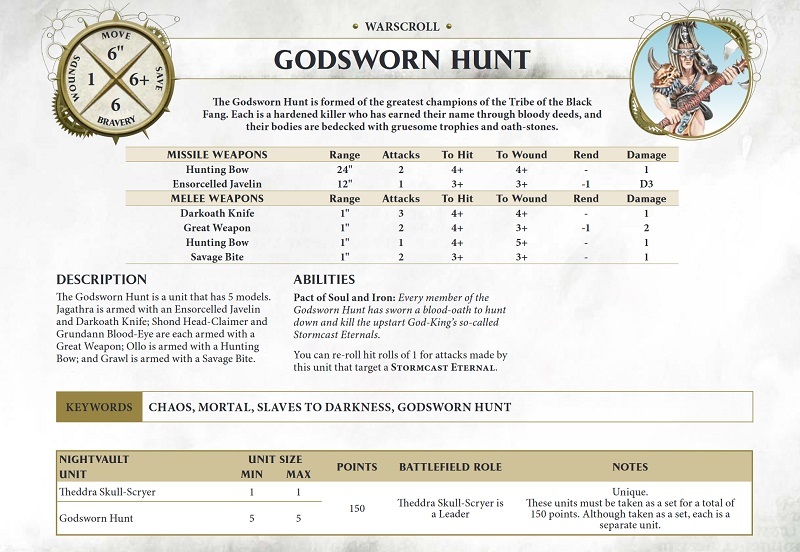 The Godsworn Hunt are five different models with five different weapons, which can be tricky to keep track of. But you’ll be hitting Stormcast Eternals on 2s and 3s, and making a ton of attacks. This five-model unit packs more of a punch than you’d think, even if they are incredibly squishy. That’s it for the Nightvault Warbands, but stay tuned for more Age of Sigmar…who knows what’s coming next?